, the only fully integrated residential and commercial software solution that is designed to save you time. Our solution eliminates mouse clicks and automatically updates all areas of the program instantly. With our advanced easy-to-use technology, RSU is expandable to meet your exact business needs. 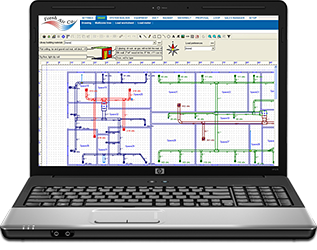 Whether you are doing residential or commercial duct, hydronic, radiant, or geothermal loop system design, Wrightsoft's Right-Suite Universal can help you to properly calculate your loads, accurately design and size your system, produce parts takeoff lists and proposals according to your parts and pricing, and prepare professional documentation and reports—all in one program, at the click of a button. Easy to use with built-in video help for any assistance you need, when you need it. All major HRAI, ACCA and ASHRAE load and duct calculation modules available, sold separately. Design duct, high-velocity duct, radiant, and geothermal systems with instant parts takeoff. Draw your load in minutes with Right-Draw® using the drag-and-drop HVAC Shapes. Automatically, your duct and radiant designs are nearly complete according to your preferences. Finalize your design and through Hotlink Technology™, your parts takeoff list and proposal are quickly generated!